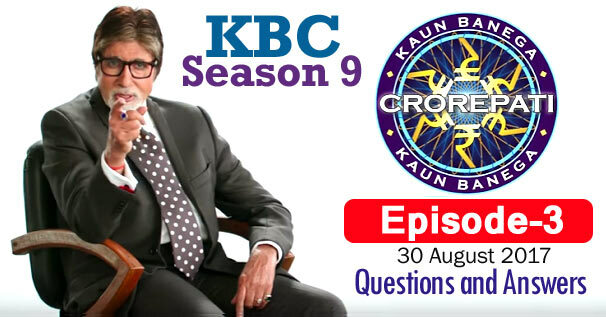 KBC Season 9 Episode 3 Questions and Answers: The third episode of Season 9 of Kaun Banega Crorepati (KBC) was telecast on 30 August 2017. In which Amitabh Bachchan had asked contestants 13 questions of General Knowledge. The correct answer to all the questions is given below each question. By reading these questions, you can prepare yourself for the next KBC Season 10 of Kaun Banega Crorepati. Because by reading these questions, you will understand what kind of questions asks Amitabh Bachchan in KBC. These all general knowledge questions will be helpful to for you various Competitive Examinations and Interviews besides KBC. Remember, the answer to some question may be in accordance with that time, while the answer to those question may differ according to the present time. 1. In 2017, which player became the leading run scorer of all time in women's ODI cricket ? 2. Which of the following states does not border Myanmar ? 3. Starting with the earliest, arrange these festivals in the order of their celebration in the calendar year of 2017 ? 4. With reference to the famous dialogue of a Hindi film "Mahi Maar raha hai ", Mahi is playing which sport ? 5. Inme se kon sa muhavra hai jiska matlab "Gussa karna hota hai " ? 6. Which of these terms is commonly used for a portable mobile battery charger ? 7. Whose of this audio? 8. The name of which of these current or former chief ministers means 'Earth' in Sanskrit? 9. Uzma Ahmad, who was forced to marry a man at gunpoint in a foreign nation, safely returned to India form which country, after an intervention by India's MEA? 10. Which of these parts of the human body are less than two in numbers? 11. In which of these Olympic games did only women get medals for India? 12. How many states in India have a coasting along the Bay of Bengal? 13. 'Notanki', 'Tamasha' aur 'Jatra' kiske parkar hai?